This post may contain affiliate links and I may get compensated when you click on the link and make a purchase. Don’t worry, there is no additional cost to you and I will specifically mention all links that fall into this category. Read more about my disclosure policy here. Check out 3 valuable tips below! You’ll be making a huge impact in no time. Start by doing 1, 2, or all 3… just START! Because that’s the hardest part after all. My reusable shopping bag folds up nicely but I like to keep it open to store all of my other bags inside. I bought this on Amazon as a set of 4. It’s taken me a few years, but I can now proudly say that I remember to bring my reusable shopping bags into the store 99% of the time. I have a set in the house that I always plan to take with me when I go grocery shopping. I also have one backup bag in each of our cars... just in case! You may be wondering how I finally got to this point of success (or you might not be...IDK) Either way, I will tell you my secret! Tough love is the best way to get yourself to remember. Try refusing plastic bags even when you forget your reusable ones… It will make you think again about bringing reusable ones with you the next time you go shopping. See my post about leaving my bags at home here. One thing I find important when picking a bag to buy is the structure of the bag. It is so much easier to use when the bag will hold its shape and has a hard bottom. The Amazon link for Reusable Shopping Totes is an affiliate link. Reusable produce bags are so convenient and easy to use! I love this set of assorted sized bags that I bought on Amazon. Quite a few years ago I bought some little mesh produce bags because I thought they were cool. 🤓 I think I was in college so most of my groceries were probably brought to me by my mom at that point. It would make sense that I ended up not really knowing what to do with them and put them away somewhere to be forgotten. Fast forward to the present time and I use these little bags so much that I had to buy another set. I was having to combine produce at the store and stuff the bags full. I don’t know if you’ve ever seen anyone do that but in case you haven’t... no one wants to be that person in the checkout line. The cashier has to separate all of your produce to ring it up individually. The Amazon link for Reusable Produce Bags is an affiliate link. 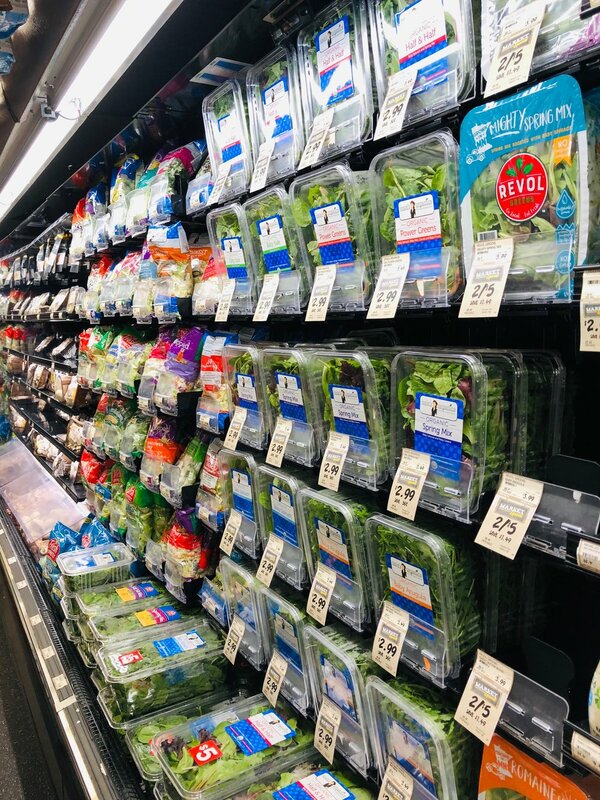 The way lettuce is packaged creates a sea of plastic in almost every grocery store. Seriously, this might be the most important one! I know grocery shopping isn’t rocket science (well maybe for those couponers... because that’s some crazy stuff!) but an open mind can help you see things differently. It can make you aware of things you’ve never noticed before. Start paying attention to the packaging everything comes in. For instance... you can buy lettuce in a plastic bag, a plastic bin, or you can buy it without a package. (This is where your reusable produce bags come in handy!! 👏🏻) Chances are the lettuce that isn’t in packaging is cheaper too. Another example would be green, yellow, red, and orange peppers. You buy them on Styrofoam and wrapped in plastic or you can buy them loose. As you go through the store, make it a goal to keep your mind open and pay attention to the different types of packaging. Your eyes will be opened and you’ll have a lot of opportunities to reduce your plastic use! Now that we’ve discussed 3 Things You Can’t Go Shopping Without, I hope you feel like you can make a difference! Every piece of plastic that we don’t use takes us a step closer to being plastic free! Trust me, I didn’t just start doing all of these things over night. It took me some time and a lot of practice to get comfortable...to form new habits. But I DID IT! And it feels great. I’m so proud of the progress I’ve made and I hope you’re on your journey to making a difference too. Do you have a favorite reusable bag or produce bags? I can’t wait to hear from you!